FLASH BACK: Administration Manager at Aurora Gold Mines, Peter Benny speaking with workers on labour relations shortly after speaking with the media. Skilled employees recently laid off from GUYSUCO’s closed or downsized estates were given the opportunity to turn their technical training towards employment in the mining sector, as Guyana Goldfields Inc./Aurora Gold Mines Inc. conducted a five-day recruitment exercise recently. 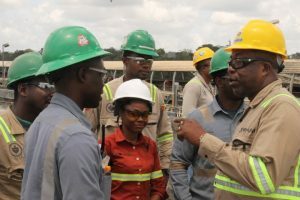 “The recruitment team endeavoured to secure the services of these employees in a continuation of the Company’s commitment to hire skilled Guyanese workers from any area to boost the efficiency of the mining operations. This was also in recognition of the fact that many of these employees who were recently laid off were graduates of the sugar industry’s training centre and possess many years of experience in much needed skill areas,” the company said in a statement. The recruitment was done in communities close to various sugar estates that have been either closed or downsized, including on Saturday last at Corriverton and on Sunday at the J.C. Chandisingh Secondary School at Rose Hall. Interviews were also completed on Monday at the Canje Secondary School and Tuesday at the Enmore Community Centre. On Wednesday, the same opportunities were offered at Wales on the East Bank of the Demerara River for persons to be employed as positions become open. AGM Inc.’s Human Resources team led the exercise supported by personnel from the various departments scouting for these technical talents, including the Mines, Mill, Maintenance workshops, Security and Camp Services. The prospective employees were told that this exercise was held to refresh and update the Company’s skills database, so that they could be considered for employment in currently existing vacancies, as well as, for any job openings that may subsequently arise, especially in the face of the Company’s expansion plans. Residents of these areas turned out in huge numbers, eagerly seeking information on the Company’s operations, which was provided in a short briefing by Mr. Benny, as well as, the opportunity to secure a job. While over thirty persons participated in the on-the-spot interviews at Corriverton, over 200 persons were present in Canje and Berbice, and an additional 200 persons at Enmore, to vie for these job opportunities. The team focussed on interviewing persons with specific skill sets, including heavy-duty mechanics, auto mechanics, welders, electricians and auto-electricians etc. Several persons were also interviewed for possible employment in the hospitality sector of the operations as well. AGM Inc. looks forward to building a long and sustainable partnership with these new members of our work team, as we continue to provide a first-class work environment and opportunity for employment to personnel from across all regions of Guyana. A similar outreach exercise is expected to be completed in Linden on Monday August 20th. To obtain more information on this outreach, please contact: AGM HR Division at 238 Thomas Street, North Cummingsburg, Georgetown,Guyana.